338 in stock Need More ? 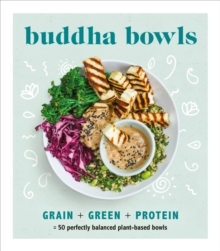 Discover the new, easy way to enjoy balanced vegetarian and vegan meals with Buddha Bowls. Just follow the very simple formula: Grain + Green + Protein (+ Zen!) for meals that are tasty, nourishing and easy to make. All recipes are vegetarian or vegan, and vegan swaps are provided throughout. Simple meals are created with inexpensive ingredients that you can easily find in your local supermarket. These recipes are designed to feed one, for easy week-night solo cooking, but can easily be doubled-up to feed a crowd. Tempting dishes take you through the day from Chia Pudding and Huevos Rancheros for breakfast, to Sweet Potato Falafel and Roasted Cauliflower and Chipotle for dinner. Protein-rich Recovery Bowls will get your strength back after a workout (or a few too many at the pub), and there are also healthy dishes inspired by your favourite take-away flavours as well as Dinner Party Bowls to share with friends. Learn how to build a perfectly balanced bowl and customize it with a host of fresh ingredients, dressings, toppings and sauces. Plant-based eating has never been so simple.